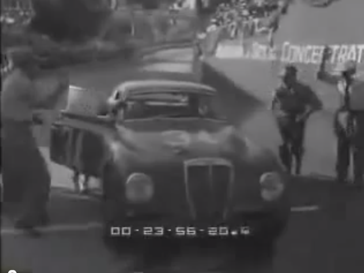 From Giovanni De Virgilio comes a link to youtube video on the Targa Florio in the 1950s. While the quality is nothing wonderful, in the first three minutes you get to see the 1952 s.2 Corsas and the1953 D20 in motion, with a wee bit of sound. Special, tantalizing and leaves you wanting more. Imagine…. Bonetto winning by pushing across the finishing line.